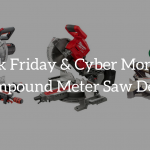 Are you looking for the best 12 inch miter saw you can get? Sometimes it’s necessary, when you find that smaller models aren’t simply cutting it when it comes to dealing with larger work pieces. So when you find that you’re working with larger pieces too often, a 12-inch miter saw simply makes sense. It’s even a good idea to get one even if you don’t work with larger pieces, if you just want to be ready just in case. Remember the Boy’s Scout Motto: Be Prepared. The nice thing about the 12-inch miter saws is that they generally have more power than your typical 10-inch miter saw. Most of them are equipped with 15-amp motors. It also gives you a higher tooth speed rate (the bigger blade contains more teeth), and this is a distinct advantage if you really need smoother cuts. And there’s some compensation for the higher price tag for the 12-inch saw, and that these tend to be more durable so they last longer. We start this list with the venerable Dewalt brand, which was established way back in 1924. Of course, now it’s a subsidiary of Black & Decker. At the very least, you know the people here are continuing a long tradition in the power tool industry. Here we have a reliable 15-amp motor behind the 12-inch blade, and it’s able to offer up to 4,000 rpm. Cutting molding and framing won’t be a problem, along with other miter cutting and cross cutting tasks. It’s designed to provide accurate cuts, as the detent plate offers 11 positive stops. This makes it easy to set up, and makes you more productive. The cam-lock miter handle is also easy to adjust and offers fast and accurate miter angles. The Dewalt DW715 Miter Saw also allows for detent override, so you can set the miter setting without the saw getting into the miter detents. 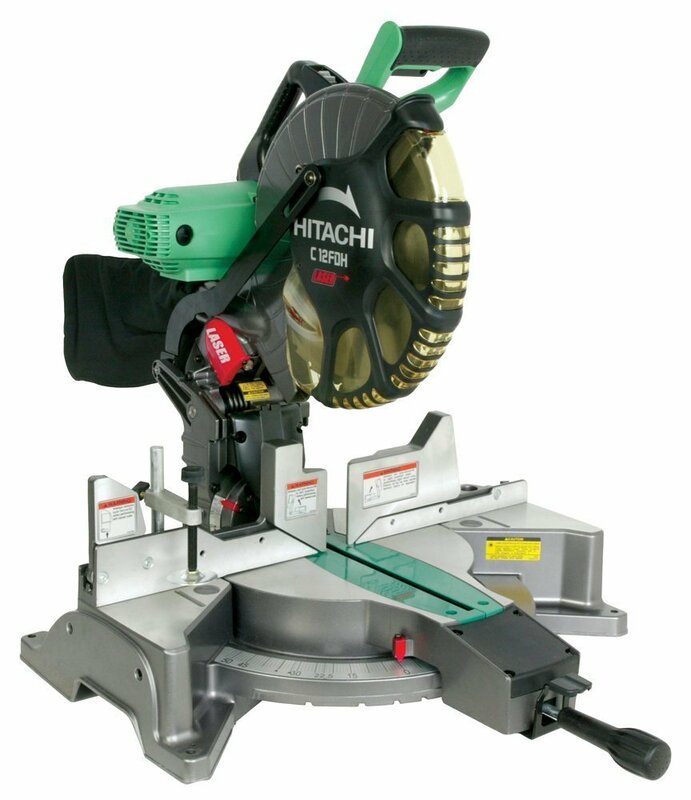 Plus, the saw is very versatile since the miter capacity is so wide. It goes up to 50 degrees to the left and right. Then there’s the tall fence. It supports 6.5-inch molding when you set it vertically against the fence. It also supports 5.25-inch molding when it’s nested vertically. Bevel cuts are also quick and accurate. You’ll get clean 45-degree cuts through lumber that measure up to 2 by 8 inches. Your bevel cuts can go up to 48 degrees to the left and up to 3 degrees to the right. And you have 4 hardened steel bevel stops which let you find and set the most commonly used bevel angles more quickly. It comes with a built-in carry handle, and with its 42-pound weight it shouldn’t be hard to move around the jobsite. The standard Dewalt warranty is also in effect, as you get 3 years for limited warranty, a year of free service, and 90 days for the money-back guarantee. The SKIL 3821-01 is also a highly regarded 12-ich miter saw, and it’s almost impossible to find a negative or even a middling customer review for it. Everyone who’s ever bought it seems impressed by what they got. It’s very suitable for intermediate DIY hobbyists. Like just about every good 12-inch miter saw, this one comes with a 15-amp motor. But it has a bit more power, as this time you have a speed of up to 4500 rpm. So the blade with its 40 teeth can really give you a high tooth rate. The maximum miter angle to the left and right is 45 degrees, and you have 9 positive stops so you can quickly set to the most common miter angles more precisely. The bevel angle is 47 degrees for both the left and right. You have convenient markings on the die cast aluminum fence, which makes cutting more accurate. The horizontal clamping system also makes sure that your wood stays in place when you’re cutting. And for really fast and accurate cuts, you also have a laser cut line guide. It has extension rails on the sides, so that you can work with bigger pieces. The lock-off switch is also convenient for both the left- and right-handed. The dust bag is effective enough to keep the workplace clean while the carry handle lets you move it without any problem. It’s only 42.5 pounds, so it’s not all that hard to carry for a short while. There’s even a quick-mount system in place so you can easily set it up with its SKIL miter saw stand. 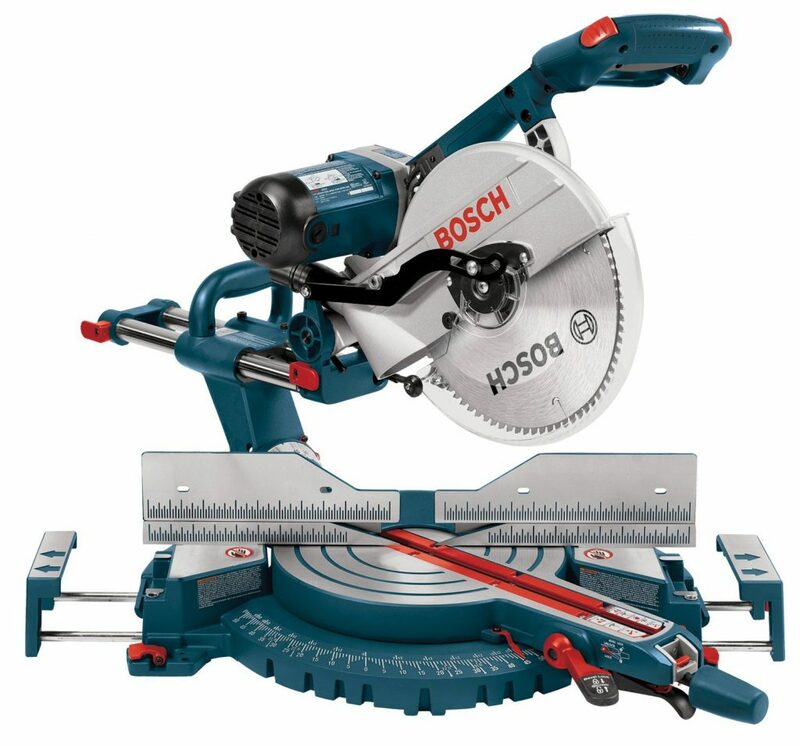 Bosch is another well-known brand in the power tool industry, and in the niche of 12-inch miter saws they’re well-represented by the Bosch 5312. What will first get your attention is that it can really accommodate large work pieces. The base alone measures 25.5 inches and with its built-in cast sliding extensions you have a total length of 40 inches. The 4.5-inch speed-track sliding fences allow for quicker bevel setups, and the system also enhances your ability to cut crown molding. Quick cuts can also be made repeatedly, as you can use the electric blade to stop it from spinning almost immediately. It already comes with a 60-tooth blade. Making adjustments on this miter saw is quite simple and quick, and the results you get are reliably accurate. There’s an easy to use range selector knob and a bevel lock lever so you can set your angles in a snap. You can also just set your bevel angle at the preset stops and detents. You get consistent and accurate miter angles with the wedge-and-slot miter detent system too. Accurate cuts come time after time due to the effectiveness of the dual sliding rail design. The miter angle range is 60 degrees on the right, and 52 degrees on the left, with several miter detents along the range. So you can just set your miter and bevel detents, and then you can get accurate crown cuts consistently. This comes with a dust bag and a wrench set. It also comes with a 1-year warranty. The Makita LS1216L is the most expensive model on this list yet here you get another 15-amp motor that offers 3200 rpm. But it’s a direct drive motor, so it requires less maintenance. And that’s not the only thing going for it. 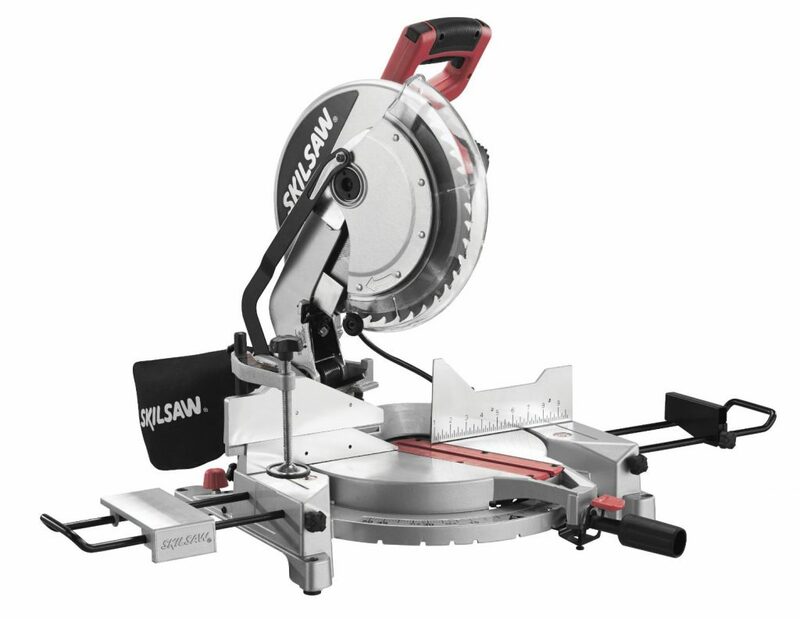 First off, this miter saw gives you the best capacities for crown cutting and crosscutting in its class. Even with no setup and right out of the box, it can crosscut wide boards of up to 15-inches wide at 90 degrees. It can cut 4 by 16-inch beams. 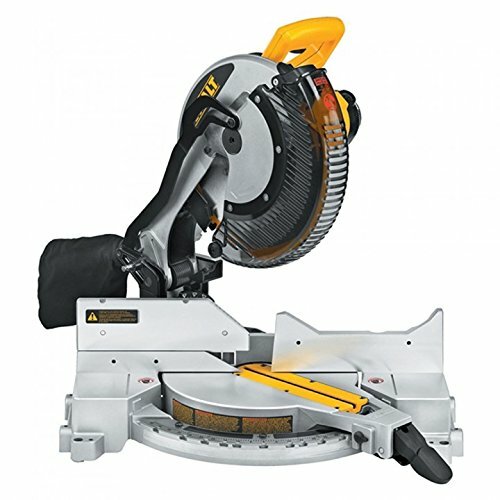 Because of the special direct drive gearbox and the unique retractable guard system, its vertical cutting capacity is astonishing and its cutting capacity for crown molding is downright the best. When you have crown molding vertically nested, the cutting capacity is at 8 inches. The baseboard cutting capacity (vertical) is at 6.5 inches. These cuts are solid, smooth, and virtually dead on, due to the 6 linear ball bearings. With the exclusive 4-Steel Rail Sliding System, the rigidity is boosted as well. The sliding fence system raises the height to 5.5 inches, and you have upper and lower adjustments for more precise cuts. It miters to the left up to 52 degrees, and up to 60 degrees to the right. The bevel lock is accessible, you have 4 positive stops for left and right, and the dual front bevel scales are more visible. The miter lock system uses a one-touch design, and there’s even a built-in laser to indicate the cut line. It’s basically chockfull of various hi-tech features that make sure your cuts are varied, accurate, and easy to make. That’s why it’s a bit expensive, and that’s why it’s worth the price. 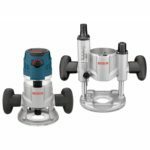 The Hitachi C12FDH may come in at just half the price of the Makita on this list, but it offers its own set of nice features. The 15-amp motor it comes with is quite powerful, as its 1950 watts of output power and 4,000 rpm let you cut through hard wood easily. The miter cut range for left or right is 52 degrees, while the bevel cut range is 48 degrees. Your compound cut range for miter and bevel is up to 45 degrees, for left and right. It’s easy enough to change the angle of the miter cuts with the thumb-actuated positive miter stops. With the bevel cuts, once you’ve secured the major bevel angle, you can make micro adjustments with the knob to get the precise angle you want. With the 5.125-inch tall, pivoting aluminum fence, crown molding can be vertically cut with fine accuracy, and you can cut pieces that measure 2 and 5/16 inches high, and 5 and 21/32 inches deep. It has a laser marker to indicate your cut line, the splinter guard boots safety, and the handle is very comfy to hold. The large base keeps the material from warping, and the carbon brushes are easy to access. And best of all, the warranty is for 5 years—no other warrant is longer for this type of miter saw. 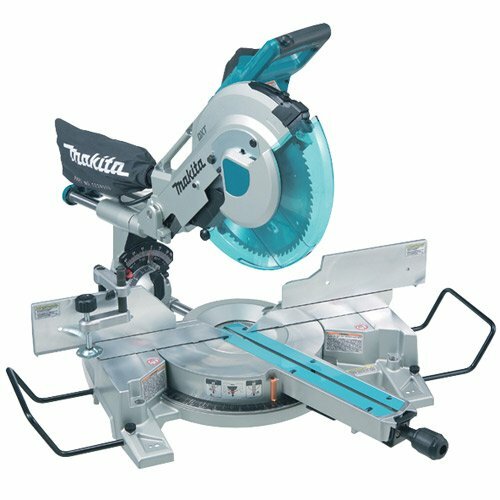 With this list of 12-inch miter saws from venerable brands, you know for a fact that you can get a tool that offers great power, accuracy, and durability. 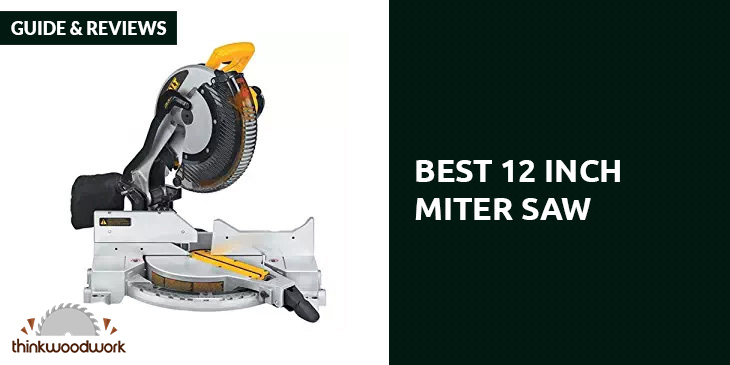 Pick the best 12-inch miter saw among the models on this list, and you’ll find yourself working more productively, more quickly, and more safely.